"This is a wonderful side dish to serve with your Asian-themed meal. So quick and easy to prepare." In a jar with a tight fitting lid, combine the garlic, ginger, soy sauce, rice vinegar, peanut oil, sesame oil and hot pepper sauce. Close the lid, and shake vigorously to blend. Set aside to let the flavors blend. Bring a large pot of water to a boil. Add udon noodles, and cook until tender, about 3 minutes. Drain, and place in a serving bowl. In a microwave-safe bowl, combine the green, red, and yellow peppers with green onion and peas. Heat in the microwave until warm, but still crisp. Add to the noodles in the bowl, and pour the dressing over all. Toss to coat everything in dressing, then sprinkle toasted sesame seeds over the top. 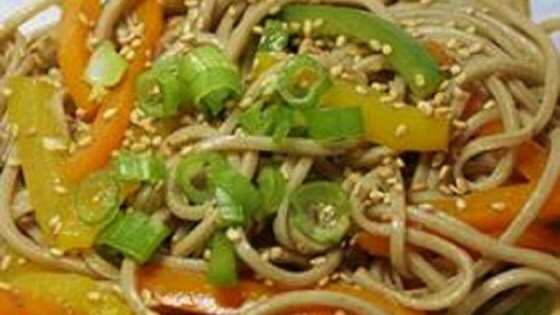 Learn how to make traditional cold sesame noodles in a tangy peanut sauce. Toast sesame seeds in a dry skillet over medium heat. Shake pan, or stir occasionally until lightly browned, about 3 minutes. I doubled everything except the dressing and it was still too oily. Very good cold from the fridge after marinating in juices. Used whole grain Udon. Changes: Replaced rice vinegar with white vinegar.